Home Education	When is it too early to start college planning? I am often asked when is the right time to start college planning. The answer to the question is a bit more involved than one might think and depends on what you mean by “college planning”. Realistically, planning for college starts when the child is quite young, and we are setting life-long expectations. For example, we often suggest to young children that they will go to Kindergarten, then elementary school, then high school and that until they complete that cycle, they will be children. Or, we tell them that they should find someone to love and then they will have children. The orderly progression of their lives is set up as expectations that we have for them. If you set an expectation that college or some other form of post-secondary training is a requirement in your family, that is what they will seek to do. On a more practical note, though, a college-going attitude begins in earnest in middle school when we present various career options to students and share with them the amount of schooling they will require to earn these jobs. For some kids, the academic life in a traditional college setting may not be the ideal; instead the hope is for a vocation that requires other kinds of study. We must never make these students feel that their goals are less important or less worthwhile than those of their college-focused peers. Making the most of their secondary school years will set both groups up for the future about which they dream. In my own practice, I like to meet with students at the end of freshman year to examine the rigor of curriculum, commitment to extracurricular activities, and participation in community service activities. If the student is not quite on track, we have time to get him in the groove. If the grades are not up to par, we can determine the reason for the performance and fix the problem. I next meet with the student at the end of sophomore year to re-evaluate the record and ensure that he is on track. The process begins in earnest in Junior year when I typically have families sign a contract that follows them until graduation. In this time, we discuss career options, course selection for senior year, college visits, and what the student and parents want in a college. I then develop the preliminary college list which the family uses to focus their research on those institutions which represent a good fit and match for the student. We discuss a testing schedule and whether test prep for the ACT or SAT is more advantageous for the student. Along the way, if issues arise, I help smooth the road so that we have no surprises when the applications are submitted. At this point, it is the student who drives the process with my help as a facilitator and guide. Parents are the cheerleaders for their student who is making his way to the life of an adult. We must focus on the student as owner of the process and its outcomes! If you need more help with this or any other aspect of college planning, please call me at 803-487-977, email charlotte@cklaar.com and www.cklaar.com. 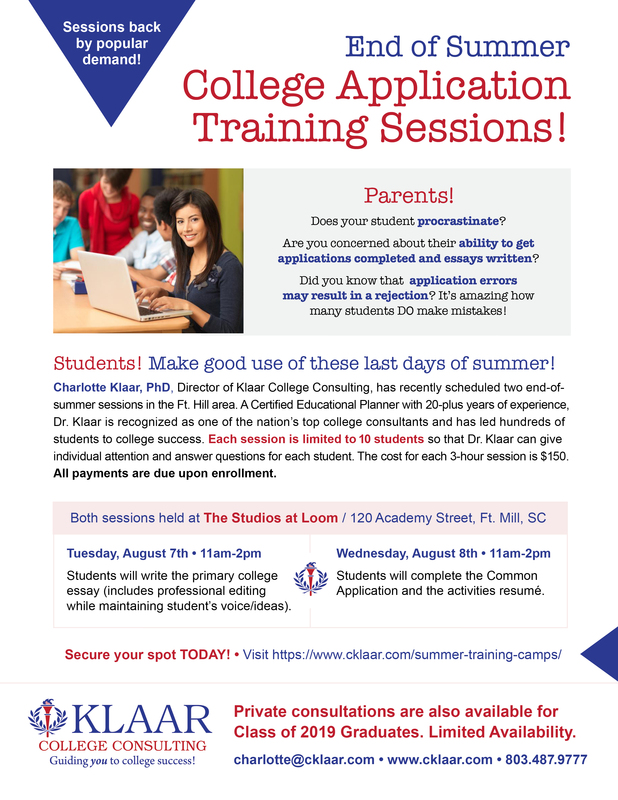 Smarty Alert: Charlotte Klaar Hosting End of Summer College Application Training Sessions THIS Week!